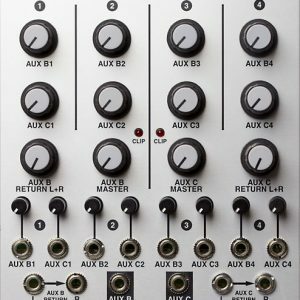 Hex linear VCA and 5:1 mixer – the Linix is the successor to the now discontinued HexVCA module. It comprises six high quality 2164 based linear VCA circuits with CV attenuation and BIAS control for each channel. The first five channels normal to a summing amp that feeds the input of sixth channel. This allows you to have voltage control of the master sum.Patching into an individual output channel breaks that channel from the master sum. 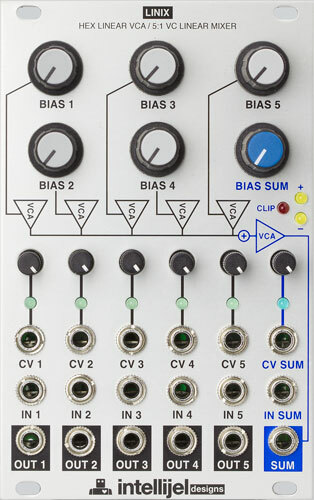 If the direct output is used for each channel then the sixth channel becomes an additional independent VCA as well (Hex VCA). Each channel has an led to monitor incoming CV activity. The SUM output has an additional set of leds to monitor the bipolar state of the final sum and a clip led to monitor the absolute max signal level. 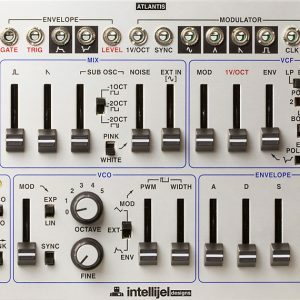 There is a 12pin header on the back to connect the Linix channel direct outputs to the inputs of an Intellijel Mutamix or Mutagen module.